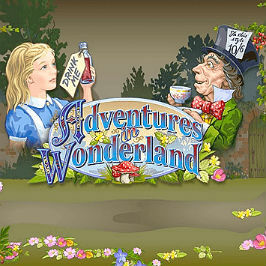 Meet Alice and other eccentrics in this wonderfully odd Adventures in Wonderland online slot. This game is powered by Ash Gaming, inspired by the much-loved story of Alice in Wonderland and features three exciting bonuses that make the game all the more adventurous. This online video slot is set across five reels and 20 paylines, and is packed with plenty of in-game action, including a progressive jackpot payout that could change your life. Find out why you should spin your way down the rabbit hole in our Adventures in Wonderland slot guide! 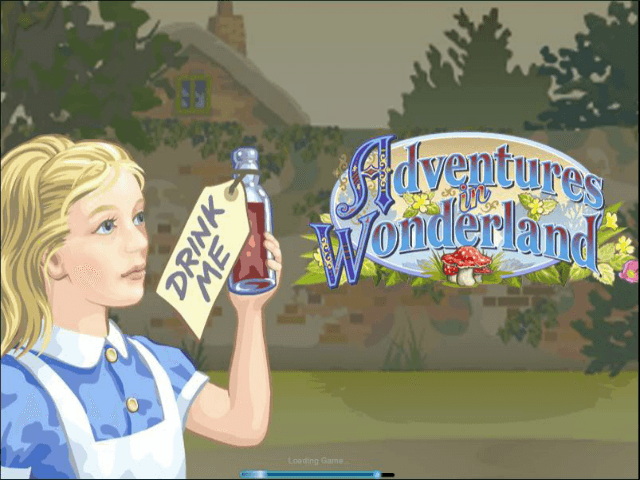 Adventures in Wonderland is a slot spin-off from the classic fairy tale that’s all about Alice, who finds herself on a surreal adventure in Wonderland. 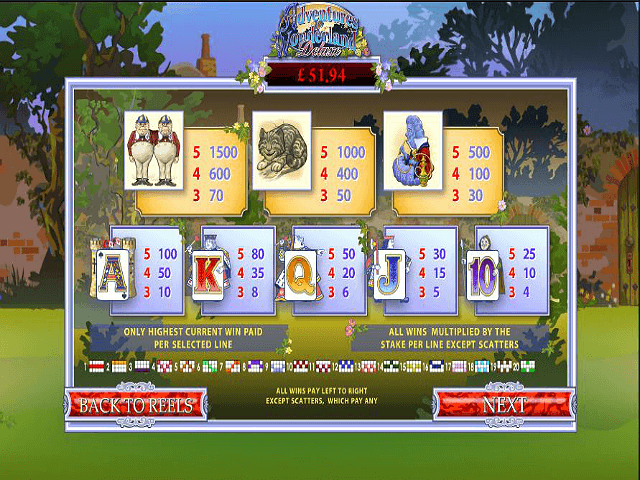 Staying true to the classic story, this video slot features symbols from Alice in Wonderland, like the grinning Cheshire Cat, the Caterpillar, Tweedle Dee and Tweedle Dum, the White Rabbit, the Mad Hatter and Alice herself. Playing cards ranging from Ace to 10 also populate the reels. This slot game can be played from just 20p a spin, with a maximum spin value of £200 for those high rollers out there. Don't be scared to enter the rabbit hole, because this slot is a breeze to play. Alice plays the Wild symbol and also substitutes other symbols on the reels bar: the bonus and Scatter symbols. Alice holding a bottle of potion can pay out as much as 10,000x your bet if you’re lucky enough to land five of these Wild symbols. 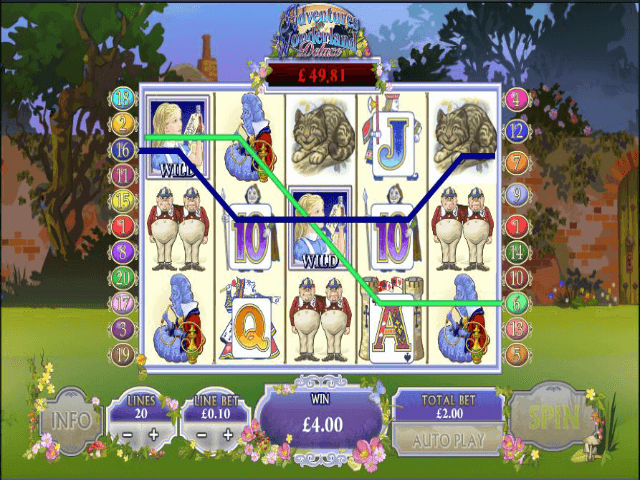 This symbol also boosts other paylines and it likes to pop up on the reels often, so there's no shortage of tempting payouts in the Adventures in Wonderland game from Ash Gaming. The Tweedle Dee and Tweedle Dum symbols, as well as the Cheshire Cat, also bring in the wins, while letters and numbers make up the lower value symbols. The Adventures of Wonderland video slot isn’t short of bonus action. First you have the Mad Hatter’s Tea Party Bonus, which is triggered by landing three or more Mad Hatter symbols anywhere on the reels. Here you have to pick from Alice, March Hare, Dormouse and Mad Hatter – the longer the character takes to drink their tea the bigger the rewards. Keep an eye out for the sugar, because if it's added to the tea before they start drinking it, you'll hit the sweet progressive jackpot. The Free Spins bonus round is activated through the White Rabbit symbol. Here players will pick up between seven and twenty extra Free Spins, which come with three to five Sticky Wilds that remain in position throughout the Free Spins bonus round. If they're in the right place at the right time then your winnings will get a nice boost. A Rabbit Hole Scatter also offers more win potential. When the Scatter is triggered, Alice will fall down the rabbit hole, collecting rewards as she goes. Join Alice on this adventure and you could leave Wonderland with a huge jackpot prize. 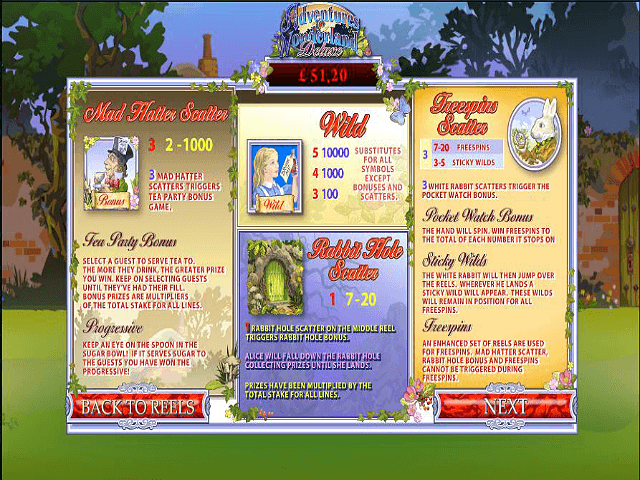 The progressive jackpot is won through the Mad Hatter's Tea Party bonus game. If one of the characters has sugar added to their tea before they drink it, then you’ll bag the progressive jackpot. Just watch the teaspoon move from the sugar pot to the character’s cup. This exciting bonus game doesn't stop there, with the progressive jackpot amount displayed at the end. Time for tea! If you like Adventures in Wonderland - You'll like these slots too!